The Mercer Industries Knot Wire Wheel provides excellent abrasion and wear resistance along with high flexing action. It has superior rotational balance which helps reduce operator fatigue and improves tool life. The loosely twisted knots cover a larger surface area and are ideal for heavy-duty cleaning and surface conditioning. 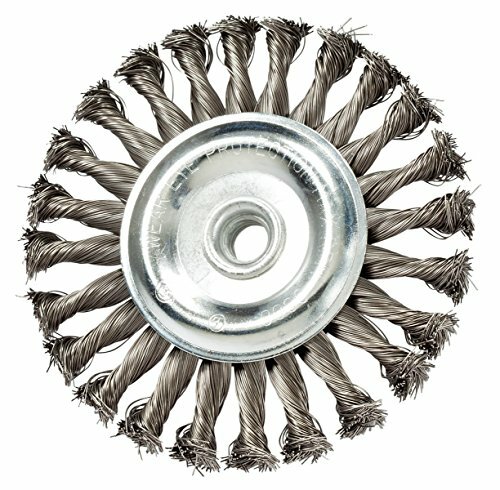 This industrial wire brush is made from high quality steel. Mercer Industries is a 3rd generation family owned company that was built on core values of Quality, Performance, Delivery, Service, and Price. Founded in 1968, Mercer Industries offers more than 3,000 products for the flooring, industrial, automotive and welding markets. Mercer, formerly known as Mercer Abrasives, is committed to serving its customers and providing quality products. For more information, visit mercer industries dot com. We're here to support you. Please contact our team at info at mercer industries dot com with questions or comments. Claims for warranty must be made within 90 days of the date of purchase. Proof of purchase required. This warranty does not cover any product that has been subject to misuse, neglect, negligence or accident, or that has been used in any way contrary to the purpose intended. If you have any questions about this product by Mercer Industries, contact us by completing and submitting the form below. If you are looking for a specif part number, please include it with your message.